Generated URLs for QR codes can be diverted freely to SNS, etc. Be sure to verify that your QR code can be scanned in an actual size, and works well before publishing it. Please don't make a direct link to the QR image. In dynamic QR, Multiple URL, and Email Builder, if we find bad settings, such as phishing, fraud, viruses, or something illegal, we might block the URL access. "QR Code" is a trademark of Denso Wave Inc.
We store the email address and URL input from the form. This is only for the case when you forget your password. Your email address will NOT be diverted to any other purposes, such as direct mail advertising or trading personal information. The input URL is stored in a Google URL shortening service via an API. This is for the scan statistic. We do NOT store the URL. We do NOT store any information you input. All data is written in your QR Code pattern. This service does not make any guarantee. Please go at your own risk when you use our service. And we might adjust the specifications without notice. A QR code creator is a web service that stores data into a QR code pattern. To create a QR code image, just input data and download it. The QR image you create has no restrictions even for commercial use. Our service is totally free and non-expiring without registration. Generated URLs for functional QR code can be diverted freely to SNS etc. Be sure to verify that your QR code can be scanned in an actual size. Please print QR images in a size of 1.2 to 3cm ( 0.5 to 1.2in ). 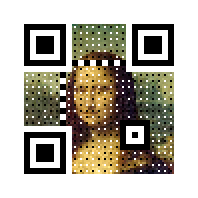 It is only possible to edit the content of a QR code with a dynamic QR. The background color needs to be much brighter than that of the cells. If you want to know scan statistics, use URL shortener first. Or add "+" at the end of the shortened URL.